Most people tend to associate WW1 soldiers as being killed during major battles, such as the Battles of Loos,Somme,Arras etc. However, the truth is much less obvious. 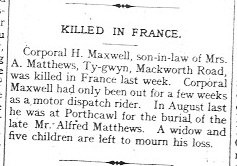 Many soldiers actually died of various diseases,accidents and ordinary ailments whilst on active service.On 9th January 1916 two Porthcawl men died in different circumstances,in different places but from non-battle related incidents. According to the 1911 Census , Harry ,as he was known, was born in 1879 in the USA of British parentage. He married Elizabeth Ann Matthews 31st December 1904 in Wimbledon. In 1901 Census Elizabeth’s family was living in Southampton which could suggest that Harry had met her sometime after disembarking at Southampton from New York. Further, Elizabeth and her family were from Porthcawl and prior to them moving to Southampton, her sister,Mary, had married Thomas George Jones , later to be Sir T.G. Jones of Beach House, Mackworth Road, Porthcawl. 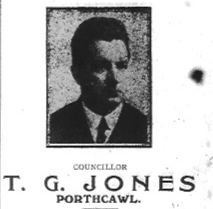 T.G.Jones was a member of the Porthcawl Council, an Estate Agent, landowner and owner of the Porthcawl News. 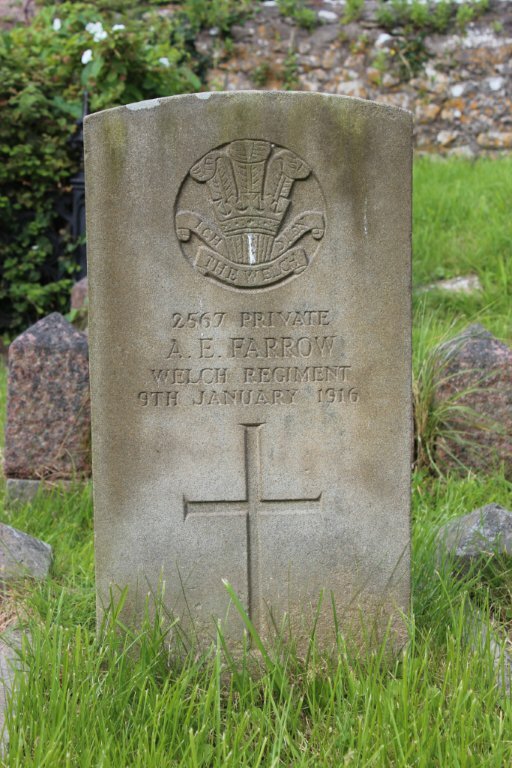 In February 1915 Albert enlisted in the 19th (Service) Battalion Welsh Regiment ( Glamorgan Pioneers).Evidence suggests that, possibly due to feeling unwell, when the regiment was posted to France in December 1915 , Albert was sent home and transferred to the newly formed 21st (Reserve) Battalion. A fortnight prior to his death he was taken seriously ill and died in hospital in Cardiff . He died on 9th January 1916 the day before he was supposed to return to training at Kinmel Park. Harry applied to join and was successfully enlisted into the Royal Engineers 33rd Company , Motor Cyclist Corps, Service No 100517, in Tottenham,London on 15th June 1915. His attestation paper signifies that he was a motorcyclist by profession, had at sometime broken his nose and wore a tattoo on his right arm. His own motorcycle, however, was not accepted as fit for purpose. Harry’s regiment left for France with the B.E.F on 11th November 1915. Harry’s death on 9th January 1916 led to a court inquiry. Medical reports state that he died from broken ribs puncturing his lungs. At the time of his death his wife, Elizabeth and his 4 children had moved to live with their grandparents at Ty Gwyn, Mackworth Road, Porthcawl. It was here that Elizabeth gave birth to Victor, on 22nd April 1916, 4 months after Harry’s death. Elizabeth received a war widow's pension of 25/- a week. She remained in Porthcawl for the rest of her life and died in December 1954. Edward, one of five children, was born early 1896 in Cefn Cribbwr to Frank and Sarah Dunster . Both his parents were originally from Somerset which would prove to be a significant fact regarding the end of his life. Edward’s parents were part of the migration from Somerset agricultural life to the mines in south Wales. His father worked in Cefn Colliery as a hewer, whereupon Edward joined him on leaving Tondu Board School in 1909. 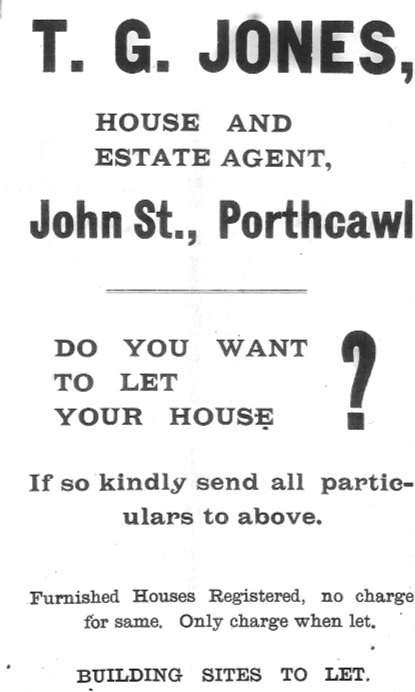 In the 1911 Census Edward, his father and siblings were living in 133 Bridgend Road, Aberkenfig. Sadly his mother had died the month before in Langport , Somerset, where her aunty lived. 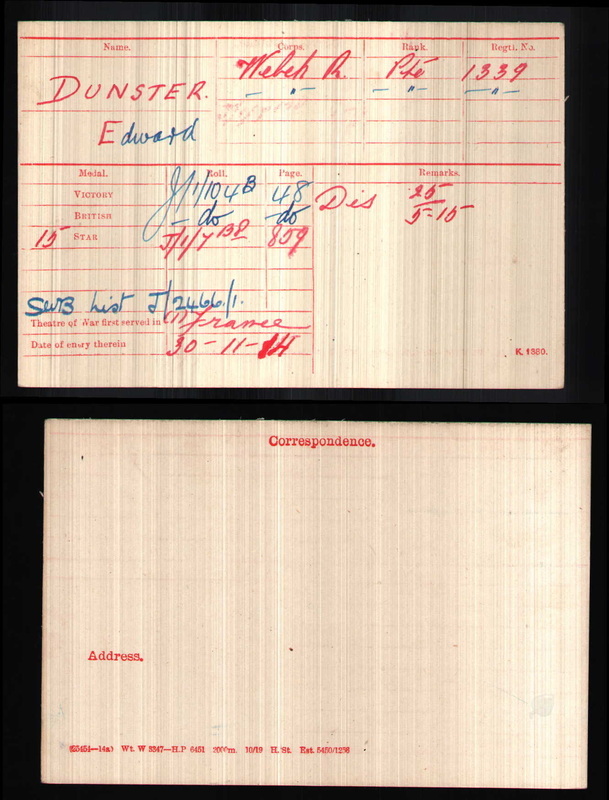 On 12th November 1913 , incorrectly giving his age as 18yrs,Edward enlisted in the 3rd Welsh Regiment, Special Reserve. There was a recruiting drive at the time in response to a perceived need for trained reservists, who could be called up in the event of war and could be sent overseas. Edward’s training was in keeping with reservists nationwide. After 4 months of drill training he returned home in March 1914. From 1st May – 27th June 1914 he completed a recruit’s course in “musketry” and a special course of training in readiness for mobilization, should it come. On 30th November, Edward was transferred to the 2nd Welsh Battalion and posted to France. Unfortunately, on 20th March 1915 he was sent home suffering from chest problems. The outcome of his medical examination in Cardiff 22nd April 1915 states that he was taken ill in December 1914 with pains across his chest. He spent 3 weeks in a field hospital but showing no signs of recovery was sent home on an ambulance ship to Bartholomew’s Hospital, London, where he remained for 6 weeks. He was reported to be emaciated and suffering from a chronic cough. His official cause of death was TB due to “exposure on active service.’ Yet, it was added that it was a latent condition made worse by active service. On enlistment Edward was 5’10” tall and 9 stone. This lack of stature plus working in a coalmine prior to being posted abroad, may have initiated his health problems. Edward was medically discharged as permanently unfit and in July was awarded a pension of 30/- a week for 12 months. This suggests they already knew that he did not have long to live. At the time of his official discharge from the army 18th May 1915 his father and brothers were living at 2 Florence Street, Nottage, Porthcawl. Edward died on 23rd February 1916, in Langport, Somerset . It may be possible that the same Aunt that cared for his mother, also, cared for him. His father, Frank, was still living at the same address in Nottage, when he died in December 1940 at Port Talbot General Hospital. 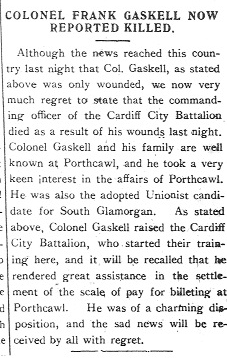 Lt Colonel Frank H .Gaskell was born late 1878 to Emily, and Joseph Gaskell C.B.E the Managing Director of North and Low’s Hancock Brewery in Bute Dock, Cardiff. Frank attended Llandaff Preparatory School where he met Reginald Pendrill St John Charles, son of a Neath solicitor; whose sister Violet, he was to marry in 1909. He,also, named his first son Reginald Charles Gaskell born in 1910. On leaving school, Frank trained to be a solicitor, himself, and gained a position in a law practice in Cardiff. In 1900 he joined the 3rd Volunteer Battalion, Welsh Regiment in which he was promoted to Honorary Lieutenant. 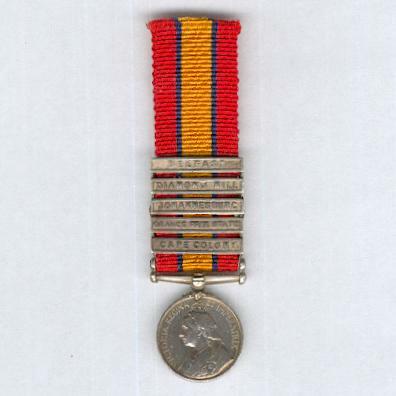 As Lieutenant in the 1st Volunteer Service Company, Welsh Regiment he served in the 2nd Boer War 1900- 1902, where he was awarded the Queen’s South Africa medal with bars, one for each state campaign, and the King’s South African medal for performing over 18months service abroad. Once home he remained in the Volunteer Battalion but returned to his work as a solicitor. In 1913 he was active in the recruitment of men for the National Reserve, in readiness for mobilization in the event of war. 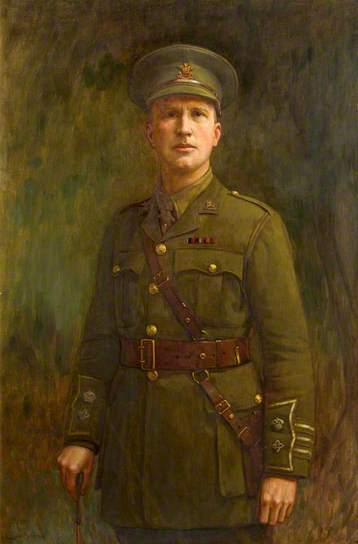 Following the outbreak of war he was promoted to the rank of Captain on 1st September 1914 and his regiment, 2nd Battalion, Welsh Regiment, part of the B.E.F, was posted to France on 19th September 1914. Wounded in action he returned home to recuperate. On 25th November 1914 he was promoted to the rank of Major and asked to raise the 16th Welsh Regiment (Cardiff City Battalion). Although this regiment was raised in Cardiff it was actually formed in Porthcawl. On 25th November 1914 he was promoted, once again, to the rank of Temporary Lieutenant Colonel and officially appointed as Commanding Officer to the 16th Welsh. Towards the end of December, 1914 the battalion was moved from Porthcawl to Colwyn Bay, North Wales. The next eight months were spent there training before they were moved to Winchester in August 1915 with other units of the 38th (Welsh) Division. They visited Cardiff in the November before embarking to France on the 4th of December, 1915. Once in France the regiment moved around continuously but whilst patrolling in the Moated Grange/ Riez Bailleul Sector, Lt Col Frank Gaskell was shot by a sniper on 15th May 1916. The bullet hit his ammunition pouches causing them to explode. He died of his wounds at Merville Hospital,on 17th May 1916 .His body was buried at Merville Cemetery. The battalion were later to experience major losses in the Battle for Mametz Wood. Most of these casualties occurred on the 7th of July, 1916 when the battalion came under heavy machine gun fire from Flatrion Copse and Sabot Copse. Although best remembered in Cardiff, Frank had forged strong ties with Porthcawl. In 1913,during his National Reserve recruitment drive, along with Captain John L Lambert, he had his son, Reginald christened at the local Catholic Church in New Road. In the year after his death his wife, Violet and his 2 sons (Francis Henry being born 1st January 1916) moved to 3 Esplanade Avenue, Porthcawl.